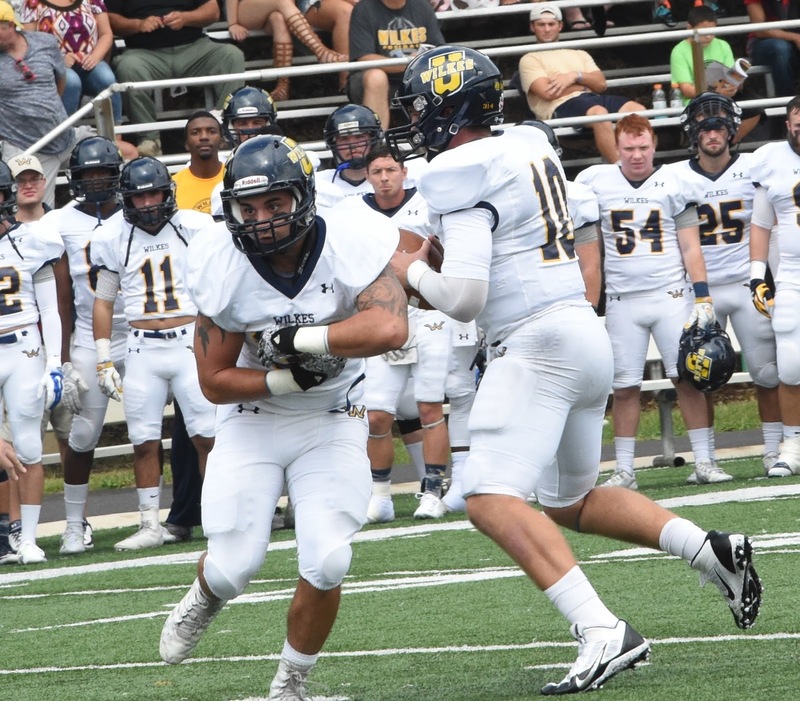 Wilkes University is coming off of a 48-17 loss against Lebanon Valley College. Stevenson is coming off of a 31-20 home win against Widener last week. Wilkes will celebrate Senior Day and Veterans Appreciation Day prior to kickoff. Ed Hottle (Frostburg State ‘99) is in his fifth season as the head coach of the Mustangs. Prior to becoming Stevenson’s first head coach, Hottle served as head coach and Assistant Athletic Director at Galludet University from 2005-2009, head coach at Calvert High School, LB and DL coach at Wesley College, defensive coordinator and head strength and conditioning coach at Denison, and DL coach at Frostburg. This will be the fifth meeting between the two schools, with the Colonels holding a 3-1 advantage in the series. The Mustangs won by a 33-14 final in Owings Mills, Md. last season. The Colonels will head to Dallas, Pa. to take on Misericordia University on November 7th at 1 p.m. This will be the fourth meeting between the two schools, with Wilkes holding a 3-0 advantage in the series. The Colonels defeated the Cougars 41-7 at Schmidt Stadium in last season’s meeting. 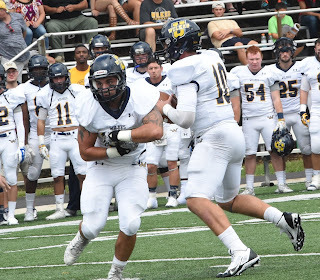 • Wilkes is ninth in the MAC in scoring offense (14.6), seventh in total offense (329.3), tenth in rushing offense (84.0) and second in passing offense (245.3). • Ryan Dailey finished against LVC 25-of-34 for 234 yards, his sixth time topping 220+ yards in his last seven games. • Dailey’ currently stands sixth with 3,882 career yards and only 185 yards away from Brad Scarborough ‘87 (3,787) for fifth on the list. Dailey ranks second in the MAC in passing yards per-game with 243.3 while standing first in attempts (301) and completions (182). His eight touchdown passes rank third in the league, while his 60.5 completion percentage ranks second. • PJ Incremona leads the Colonels ground attack standing seventh in the league with an average of 60.7 yards per game. William Deemer, the team’s top receiver, ranks fourth in the league with 39 receptions, and is sixth in the MAC with an average of 58.1 yards per game. Aaron Coyne has scored four touchdowns ranking third in the MAC for all receivers. • Wilkes is ninth in the MAC in scoring defense (36.6), eighth in total defense (430.9), seventh in rushing defense (183.3) and ninth in passing defense (247.6). • Jason Ugwu and Lukas Wood each had a half sack, with Ugwu also forcing a fumble against Lebanon Valley. • Linebacker Tanner Stengel leads the league with 12.1 tackles per game and ranks third with 10.0 tackles for loss. Isaiah Robinson and Jared Powell pace the secondary, as Robinson has 46 tackles, 4.5 for loss, two pass breakups, and one interception, and Powell has 44 stops, 1.0 for loss, six breakups, and one interception. • Stevenson ranks sixth the MAC in scoring offense (23.1), sixth in total offense (332.9), sixth in rushing offense (128.7) and fifth in passing offense (204.1). • The ground game is led by Kiandre Burrell, who ranks fourth in the MAC with 76.7 yards per game and ranks sixth with three touchdowns. • Quarterback Brad Harmon made his first career start last week and completed 25 of 36 passes for 216 with 2 touchdowns and 2 interceptions. His primary target has been Cortez Taylor, who ranks 20th in the league with 21 catches. • Stevenson is first in the MAC in scoring defense (13.6), second in total defense (275.4), third in rushing defense (115.9) and second in passing defense (159.6). • Brady Kempa has paced the defense, as he is tops on the team with 66 total tackles including 34 solo stops. He also has claimed 3.5 tackles for loss on the season, 1.5 sacks, three interceptions, one forced fumble and two fumble recoveries.